From the Eureka Visitors Center, located two blocks away at the Clarke Historical Museum. Entertainment, Where to Stay, Shopping, Dining, Activities, Culture & History. You can also pick up their free 114 page publication at our store. Great calendar of events and links to more resources. Official Travel Site of Humboldt County, from the Visitors Bureau. The arts are alive and well in Humboldt County. Free weekly journal of people, politics and art. Also check out Humboldt Insider. Both available outside our store and on-line. "Winter Morning, Kailuwtadin Flat," oil on canvas. Though we are rapidly eliminating the habitats that created us and most of us now live in cities, we are still the ancient creatures that evolved to live in those wild places. With our instincts pretty much intact, it would be surprising if we did not still have inborn skills for many levels of perception, especially of the environments in which we evolved. It's likely that we all have vivid, direct perception of these realities when very young, but the world of symbols and artificial values intercedes to cause many of us to forget to look or to substitute symbols for reality. I remember spending immeasurable segments of time as a young kid, absorbed in the colors in a butterfly's wing, the inside of a wildflower, or the light in the woods. As more or less a grownup, this shift to direct perception is much diluted visually and emotionally. I am often reminded of it, though and have spent much of my life looking closely at everything. Friends and family have long been rolling their eyes as I point out the amazing characteristics of this or that. I am often surprised at how little so many seem to notice. My painting pushes me to look and to see and feel more. The better I see, the more I seem to be able to locate compositions that may cause or suggest this shift in perception and feeling. If my work can communicate or suggest some of these perceptions, I will have some success, and viewers of my paintings may get a glimpse of something real and perhaps meaningful to them. I find, as perhaps do others, that when I can feel I'm a part of this larger, older world, it gives depth, meaning, and comfort to me, far beyond what most of civilization offers. A bleak future will surely follow our increasing tendency to ignore the non-human world, for which so many no longer have knowledge, interest, or feeling. Realist art of the older, natural world, if done just right, may be able to remind people to start looking again. "Cube Rock below Kahustadin," oil on canvas. My development as an artist has proceeded in a somewhat unconventional way. I come to my work from a deep connection to, and understanding of my subjects. When I was four my family moved from the city to the country, where I completely and permanently immersed myself in the natural world. My mother, an artist, encouraged this and in lieu of kindergarten I did natural history studies including formal plant and insect collections and artwork relating to these subjects under the supervision of a neighbor, Dr. Julian Steyermark, curator of Chicago's Field Museum. All through grade school and beyond, my passion was exploring the woods, creeks, lakes, swamps and old fields of my rural Illinois surroundings, looking closely at everything. My mother was my school art teacher through eighth grade; a thorough art background was mandatory. Looking for a career where I could continue roaming the wilds I earned a Bachelor's degree in forestry at Colorado State University. Later, in Northern California I got a Master of Arts degree in biology and vegetation ecology at Humboldt State University. While in graduate school I also took many art courses and designed and built my own large oil-fired kiln and a wheel and was a professional potter for some years. In the years since then I have been teaching art and science at our small, mountain school and painting, while helping to raise our kids, developing and working on our homestead farm, and exploring the local mountains. 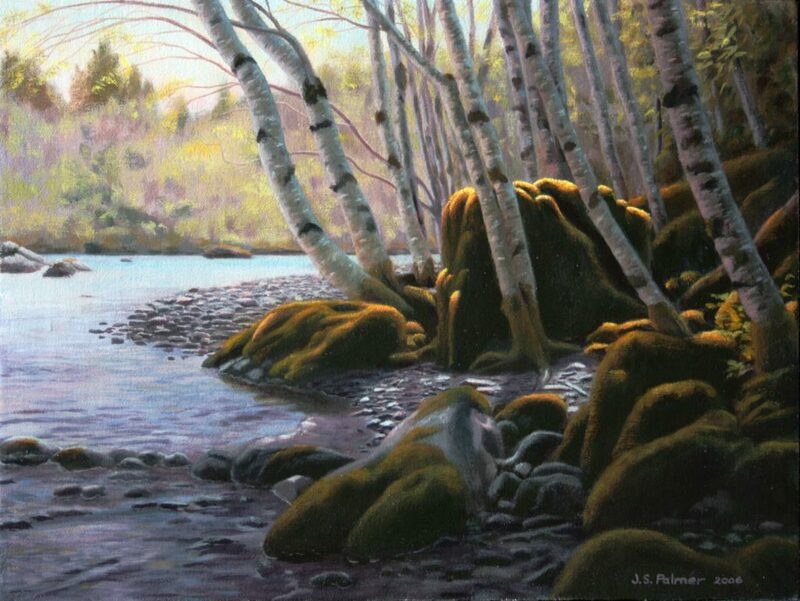 In addition to this art education and experience, I have absorbed the classic landscape painting instruction of John F. Carlson, and have studied landscape painting with Stock Schlueter. Since 2001 I have had twenty-some solo exhibitions and have won nine awards in group and juried exhibitions. I try to find the light that creates engaging compositions that also strike me with the emotional and perceptual intensity that I first experienced as a child. I spend every available moment hiking the local mountains, looking in all my favorite places for that light, and trying to paint it. In painting I strive to capture an encompassing interpretation of a landscape, broadly informed by my scientific understanding of the botanical, ecological and geological elements along with my lifelong observational experience and emotional connection. I like to think that my work might give viewers a glimpse or reminder of common but increasingly often overlooked moments when they may reconnect directly and emotionally with the natural world. 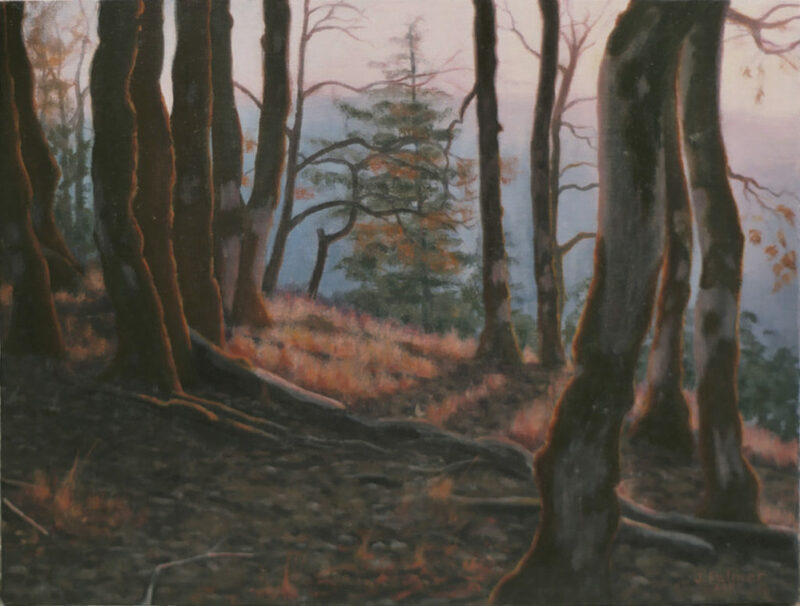 "Late Autumn Ridge-Light," oil on canvas. Join us for Arts! Alive, from 6 to 9 p.m. on the first Saturday of every month, a gala arts walk in Old Town and Downtown Eureka. Every gallery, store and restaurant that showcases the work of local artists is open, the artists whose works are on exhibit are usually present to talk with you about what they do, refreshments are sometimes served, live music can often be heard, and hordes of happy people of all ages stroll from place to place, soaking in the scene and seeing a lot of great artwork. Visitors to the area who love the arts and the best of small town life, would do well to plan their trip to coincide with this monthly, year-round, rain-or-shine event. Most of the chandeliers and pendants pictured here, can be lengthened or shortened or otherwise modified to be suitable for most ceilings. Often, we can offer to shorten a piece at no extra charge, or lengthen it for a modest surcharge, or make a fixture that was designed for a level ceiling, suitable for installation from a sloped ceiling. Please inquire about the possibility of hanging a certain fixture in a particular location in your home, before ruling it out based on its length or design. To determine the proper length of your lighting fixture, we need to know the height of the ceiling where it will be installed, and whether it will be an overhead light or hang over a table (or kitchen counter or bar). We'll also need to know whether the ceiling is level, or sloped (a.k.a. pitched, cathedral). The easiest way to measure the height of your ceiling, requires a 1" wide, retractable tape measure. Pull it out a few feet and, bending it over, put the end on the floor. Repeatedly pulling out more tape, advance the bend in the tape upward until it touches the ceiling. If you cannot read the tape at that height, grasp both legs of the bent-over tape and lower it down to eye level to get your reading. If you are math-challenged, think only in terms of inches, not feet -- it will be so much easier. If your fixture is to hang overhead, we feel it is necessary that it hang no lower than 80" (6'8"), the height of a standard door jamb, and we would generally recommend at least 84" (7') whenever possible. If your ceiling is at least ten feet high, it is helpful to consider a general rule of pleasing proportions, that a lighting fixture should hang one-third of the way to the floor. To follow this guideline, from a twelve-foot ceiling, a fixture would hang 48" to a height of 96" (8'); from an eleven-foot ceiling, it would hang 44" to a height of 88" (7'4"); from a ten-foot ceiling, it would hang 40" to a height of 80" (6'8"). I think most with a ten-foot ceiling, however, would be happier with a fixture 36" long, that hung no lower than 7' high, especially if they are fairly tall. I feel that the old rule of thumb, that a chandelier should hang down to a height of 30" above the table, is too low for most homes today. If the top of a dining table is 30" high, give or take an inch, this rule would place the bottom of a chandelier at only five foot high. While this might be fine for a formal dining room in a traditional setting, where family and guests enter and immediately sit, and stay seated until they rise and leave the room, today, many have a dining table more integrated with the rest of the home, and often socialize in a more informal way, standing in the kitchen or around the table, and talking to one another across the table. I am 6'2" tall, and in order for a chandelier not to be "in my face," interfering with making direct eye contact across the table with another tall person, it needs to be a little higher than that. Some say that we are taller than our eighteenth century counterparts, due perhaps to better nutrition. Also, our modern incandescent, flourescent and LED lamps both are much brighter than the candle, oil lamp, open-flame gas and early electric lighting of over a century ago, when a luminaire had to be hung as low as possible to give enough light down at table level. Therefore, in most situations, I recommend that a lighting fixture be sized to hang down to 6' (72") high over the table or kitchen counter or bar, or at the most, to 5'8" (68"), if the visual mass is not the lowest portion of the fixture. This means a fixture 24-28" long from an eight-foot ceiling, 36" long from a nine-foot ceiling, 48" long from a ten-foot ceiling, etc. If you have eight foot ceilings, you may consider the lights in our "chandeliers" catagory for over your dining table, as many of them can be shortened to 24" or so. Elsewhere, you can shop the "flushmount" category, for fixtures that mount flush to the ceiling or hang no lower than 16" (for a minimum clearance of 6'8" (80"). For bedrooms, hallways and bathrooms especially, consider bead-chain fixtures, with beautiful shades from the 1930s-early '40s. There are many lovely vintage shades available, which we sell mainly with new fixtures, either solid brass (polished and lacquered, or nickel plated and polished), or steel (which are cheaper, but susceptible to rust). If this is the type of fixture for you, choose the shade you like, the type of new fixture you want (solid brass or painted steel) and its finish (brass, polished and lacquered; polished nickel; or steel, painted "antique brass," "oil rubbed bronze," "coppery chocolate," "satin black," "antique gold," etc. Note, these fixtures have just one light (60 watt max. ), hang only about ten inches from the ceiling with shade, are not very expensive, and can be changed up easily by acquiring alternate shades (seasonally, when you tire of that color, etc.). Bead chain fixtures are not yet on the website; call for more information. If you have a sloped ceiling, and are in love with a gaslight, gas-electric combination, or early electric pendant or chandelier, some modification will have to be made to your fixture, to allow it to hang plumb from a ceiling that is not level. Remember, gas lighting required plumbing; the iron pipe bringing gas to a chandelier came out of a level ceiling at a right angle to the ceiling. (A "gas" light that hangs from a chain is obviously not authentic!) Such a fixture can be modified to have a loop at the top of its down rod which can interlock with a loop on a low-profile canopy, or can be joined to a loop on the canopy with a single link of chain. Or, an adjustable, brass swivel can be interposed between the top of the downrod and the canopy. However, either method will spoil somewhat the historic authenticity of such a fixture. Alternatively, a wooden, wedge shaped block can be attached to your ceiling at the point where the pendant or chandelier will be installed, to provide a level point for its mounting. This can be textured if necessary and painted to blend in with your ceiling, and would mean your gas or early electric fixture would not have to be altered from its original design. A half-inch deep, surface mounted "pancake" junction box could be screwed to the bottom surface of the wedge, for a respectable installation by today's standards. Talk to your contractor or handyman about the feasibility of this approach in your situation. If a fixture you are interested in, hangs on a chain from a deep canopy with a blind stem, here we would also recommend switching to a relatively flat, or low-profile canopy, so that such a stem would not protrude from the canopy at a weird angle, before the chain hangs plumb from that point. Unless you request otherwise, your lighting fixture will come with a crossbar or bracket for mounting to a modern junction box, which we assume will be recessed in the ceiling or wall, its bottom or front surface more or less flush with the surface of the ceiling or wall. If you would rather we provide an old-fashioned, three- or four-footed iron or steel mounting foot which screws directly through the lath and plaster into a ceiling joist or wall stud, or if you intend to install to a pancake junction box, please let us know! The contour of some canopies will not cover a pancake j-box, and the inner pipe of your pendant or chandelier may have to be shortened slightly to attach to either type of surface mounted hardware, as the outer tubing of the downrod may not be long enough to allow the canopy to slide down the additional half inch or more. We try to make all our products a cinch to install. Just let us know what you've got, so we can make sure you get what you need!